For a great experience, turn to your LLumar commercial window tint dealer in Palm Desesrt. Work more comfortably, help reduce your business's energy costs, and give your building an added layer of security and privacy with commercial window tinting. For more than 60 years, LLumar's commercial window tints in Palm Desesrt have provided businesses with protection from the sun’s heat and harmful rays. Whether you're located in a downtown highrise or a suburban office park, we're here to help you work more comfortably! Your Palm Desesrt commercial window tinting company has been carefully selected and certified in order to provide you with a great service experience. Get a fast and free tinting estimate from your Palm Desesrt commercial tint location! When you choose custom window tinting in Palm Desesrt for your business, you can help reduce your facility’s energy expenses while achieving a look that’s professional, polished, and unique to you. Ranging from crystal clear to deep charcoal, there’s a tint shade to match the needs of your business. Once installed by your LLumar location, non-reflective window tint offers a uniform look that blends flawlessly with your building. For companies that could benefit from a shinier exterior to enhance solar heat rejection, but a less reflective interior for added privacy at night, a dual-reflective option is also available. 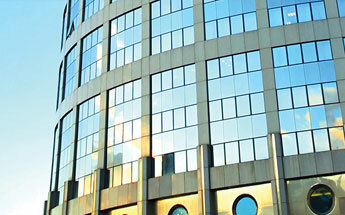 Commercial window tint can be used beyond the exterior of a building, though. Inside your facility, it can be installed as an additional design feature that offers style and privacy in stairwells, conference rooms, and on interior office windows. Call or visit your LLumar window tinting company in Palm Desesrt to get started on your commercial tinting project.